The entryway into Portuguese Bend was installed earlier this week. Courtesy of Luis Navarro. 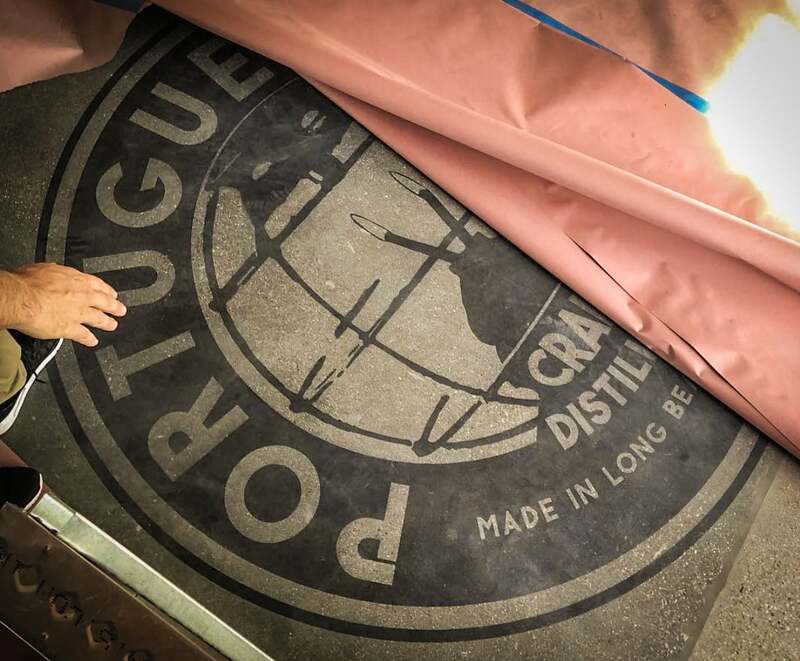 Long Beach’s first distillery, Portuguese Bend, is set to open in April as construction moves forward since breaking ground last October. 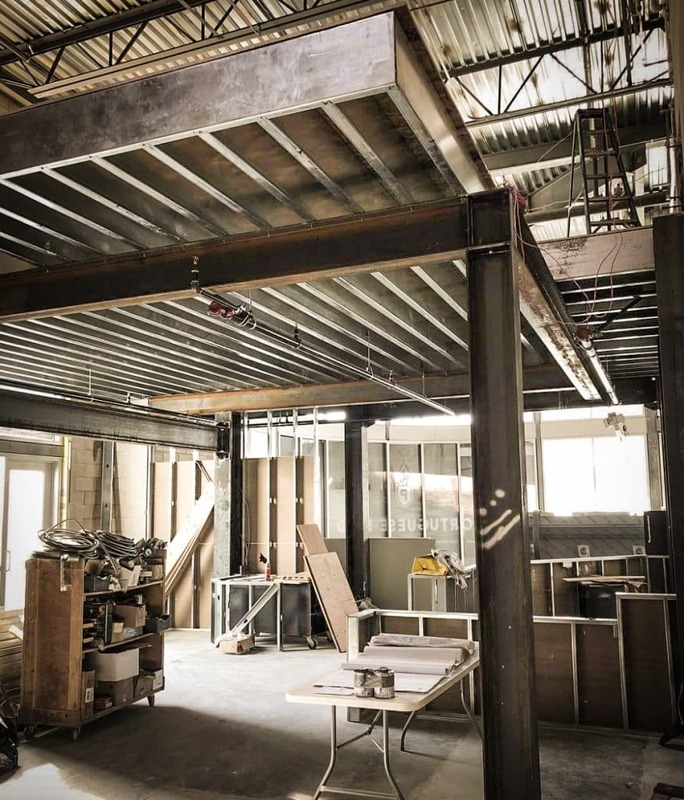 Announcing the endeavor in 2017, owners Luis Navarro and Brenda Riviera are making their third dive into the Long Beach gastronomy scene—behind their existing two Lola’s locations as well as The Social List on Fourth Street—while offering the city its first Made In Long Beach spirits. And the spirits are distinct thanks to master distiller Simon Haxton, who has created libations that span an incredible spectrum of flavors. From a bright and magenta-tinted gin (thanks to the addition of hibiscus) that is dangerously sip-able—even when served neat, bucking the long-held tradition that made gin stand out from other spirits: Gin is never meant to drink neat—to a high ABV naval rum, the offerings at Portuguese Bend aren’t just set to distinguish Long Beach apart from other distilleries but to set the state apart as well. Construction moves forward on Portuguese Bend in Downtown Long Beach. Courtesy of Luis Navarro. To continue with this “spirit” of the state, all three owners—Riviera, Navarro, and Haxton—have delved into the history of the region in terms of alcohol, particularly examining how Portuguese Bend in the bay acted as the epicenter of the illegal booze trade for SoCal. The 1920s was arguably one of America’s most vibrant and, on its flip side, depressing times: Backed by a booming economy and the start of Prohibition in the early start of the decade, the nation’s urban centers—Los Angeles definitively included, with Portuguese Bend leading the way—became the core of debauchery and non-stop partying. By the end of the decade, the country would see the worst economic fallout of its history and usher in the Great Depression and, by uplifting the ban on alcohol, also usher in an era of American distilling. These rich histories will all play part in how Portuguese Bend attempts to create a cohesive offering of distinctly classic cocktails and food while also maintaining a feel that is thoroughly and distinctly contemporary: The Retail Design Collaborative’s design of the space eschews the ubiquitous aesthetic currently found in breweries and distilleries—there is not an ounce of reclaimed wood, parallel slats, or Edison bulbs to be found—and instead centers in on creating a dark, grand space. A 22-foot high wall will be lined with bottles while wood light fixtures pay homage to the boats and smugglers who turned the bay near San Pedro into the central nervous system of SoCal’s booze transiting during Prohibition. Add onto this giant glass panels that allow patrons the ability to watch the distilling process in action and you have what will arguably be the city’s most unique drinking experiences. Portuguese Bend is located at 300 N. Promenade in Downtown Long Beach.